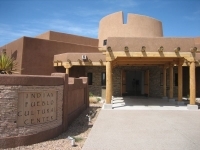 The Indian Pueblo Cultural Center is designed to give an introduction to New Mexico's rich Native American cultural heritage and the 19 individual pueblo communities of the State. The centre is situated on 12th Street, about a mile northeast of the Old Town in Albuquerque. It is a recreation of Pueblo Bonito, a ruined Indian village in the Chaco Culture National Historic Park dating from the 9th century. The centre also features a museum displaying early photographs, artefacts, and artworks. A restaurant serves traditional fare, and traditional dances are performed by different tribal groups. Those interested in seeing the real thing can make an excursion to Pueblo Acoma, 60 miles (96km) west of Albuquerque, the oldest inhabited village in the United States, situated on a 367-foot (112m) high sandstone rock. Opening times: Daily 9am-5pm, closed major holidays. Admission: $8.40 adults, free for children under 5; other concessions available.